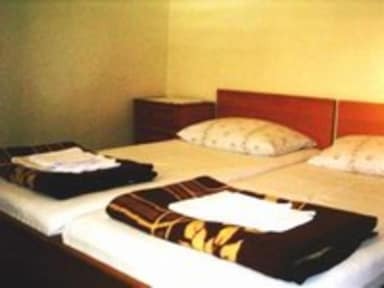 Our guesthouse is situated close to the Port of Dubrovnik and Central bus station. There are a few restaurants, caffe bars, banks, market and department store nearby. The Old Town is ca 2 km from the house (by bus ca 10 min or walking ca 20 min). In front of the house there is large terrace with green area and lot of flowers. - 3studio appartments with private kitchen and bathroom. All our guests were very satisfied with our hospitality and they recommended us to their friends. Our guests are from all over the world. So, give us a chance to show you how kind we are and how we can make your stay in Dubrovnik much better and comfortable.Welcome! Die Zimmer sind sehr sauber und schön eingerichtet und mit einer Klimaanlage versehen. Die Betten waren sehr bequem. Im Hof sieht es auch sehr schön und mediterran aus. Die Unterkunft ist ca. 10 Gehminuten von der zentralen Busstation entfernt und ca. 25 Gehminuten von der Altstadt. Besonders gefallen hat uns aber die Freundlichkeit und Hilfsbereitschaft unserer Gastgeberin. Sie war sehr zuvorkommend und hat sich viel Zeit genommen uns Tipps für unseren Aufenthalt zu geben. We had a really great time at Vila Marija. Our host took time to sit down with us and explained everything we needed or wanted to know over tea and coffee! The apartment had everything we needed and if not I'm sure our host would have borrowed it to us. 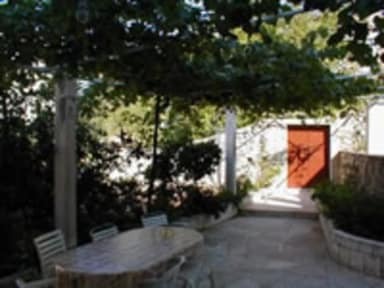 It is clean and has a wonderful garden and terrace. The atmoshpere is really great, our host was very open-minded, positive and chatty. So we enjoyed our time a lot and can recommend everybody to stay in Vila Marija! The apartment we had is one of 4(?) in the house where the hosts and their parents/ in law live. We had a private terrace right in front of our small but lovely room. The bathroom is simple but there is all you need. We also had a fridge in our room. The location is good. You can walk to old town in 15-20 minutes. A very good pizza restaurant is nearby as well as a supermarket and bakerys. Dubrovnik is beautiful, but full of tourist. With this accomodation you have your own island of calm. Villa Marina is close to the main bus station, outside of the old City. It's a very quiet area, room, house and garden a super nice and the host extremely friendly. Definitely a good and cheap place in Dubrovnik, If you prefer a quiet place over a party location. Milijana was a superb host. She helped us find a parking spot, told us a lot of tips and tricks what to do and how to explore Dubrovnik. The Appartement was big, with a well-equipped kitchen, a small private bathroom and a balcony from which you could see the sea. Walking to the old town took about 15 to 20 mins but we decided to get a bus ticket to get around the city even easier. We fully recommend staying here. This accommodation is absolutely wonderful. Our stay at Marija's place couldn't have been any better. The accommodation is exactly like shown in the pictures, if not even better. The apartment had everything we needed and Marija was really kind to get us settled and gave us some information about Dubrovnik. We would always book this accomodation again when we should come back to Dubrovnik! Die Gastgeberin Milica ist super nett und wenn man Fragen hat, kann man immer zu ihr nach oben kommen. Bei unserer Ankunft hat sie uns Tipps gegeben und alles zur Stadt erklärt. Die Küche ist super ausgestattet und alles war sehr sauber. Der Weg in die Altstadt ist ein bisschen länger, aber das macht nichts, denn die Bushaltestelle ist gleich um die Ecke. Gleich um die Ecke ist auch ein günstiges und leckeres italienisches Restaurant.